I'm intrigued by some of the information that Mariotti offers about Mader, which I plan to follow up with him in due course. In general, the volume gives a fascinating picture of the cultural and botanical activities of Germans and other foreigners on the Riviera around 1900. Since it includes brief references to Ellen Wilmott (pages 63, 95) I copy this to Tamsin Treverton Jones. When I met her at my talk in Bristol I mentioned to her ‘The British Colonies in the Italian Riviera in the '800 and '900’ by Alessandro Bartoli, Fondazione "A. de Mari" Cassi di Risparmio di Savona, 2008 (188 pages) as a possible source for Wilmott. But although it has much information on expatriates, including CB, Thomas Hanbury, and many others, I see that Ellen Wilmott doesn't figure in the index. Presentation of the Conference Proceedings "Alwin Berger and others. The signs of German culture in the gardens and in the Riviera landscape. Before and after the Great War"
Biographical exhibition on Alwin Berger, curator of the GBH from 1897 to 1915. Written by Marcus Bicknell on 22 November 2017 . The talk I and Dr Giovanni Russo gave in Bordighera's Museo Bicknell on Saturday 11 October went down well. Sophie Forestier of Nice Matin, a great Clarence fan who lives in Tende where he was buried, wrote a cracking article with all the facts and a good feel too. You can look at the article in French at download. Written by Marcus Bicknell on 31 October 2017 . If humans were vegetables, then Clarence Bicknell would be a beguiling, mysterious onion. A man of many layers, a courageous maverick of his contemporary, Victorian straight jacket era, he threw off convention and followed his passions. Next year, 2018 will be the centenary of his death. Our contemporary world, with its dumbed-down global travel and accessible trekking common-place, Bicknell reminds us of the pioneering mind-set incorporating rudimentary modes of transport and the sheer devotion of time and discomfort of discovery. 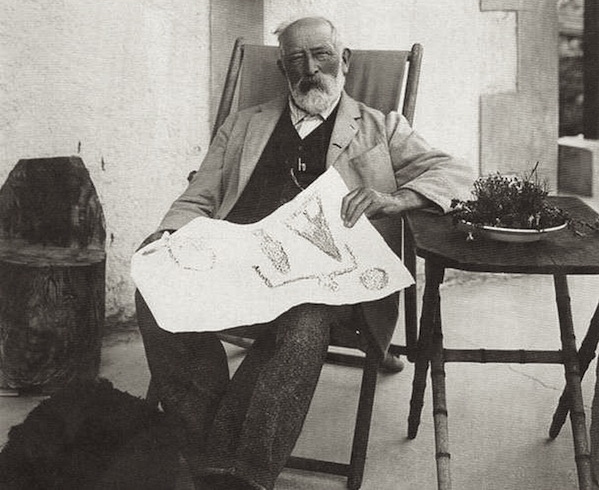 He provided the turn-of the-Century world with early botanic and rock-carving discoveries, meticulous archiving, and water-colours to rival the peer-group establish visual artists, frequent visitors to the London parental home. His life journey took him from South London to the Merveilles valley, Alpes-Maritimes. Specifically, he threw off the career/life-plan which accompanied a comfortable, Victorian existence, especially the claustrophobia of clerical life. Never losing his personal faith, he eschewed the life of a parish vicar, in the easy existence of the South of France, instead profiting from its climactic provision of flora and fauna. Bicknell’s solitary, reflective life did not preclude a broad-view, humanitarian engagement with the wider world. Almost as a balance to his intense, focussed mountain life, his shrewd investments benefitted charitable projects - a poorhouse in Shropshire and a hospital in Bordighera. His exercise and promotion of Esperanto and generosity in sharing his findings with a growing academic community is evidence that this is no reclusive hermit, turning his back on the world. It’s a cliché to speculate that his background - closeted life at Cambridge, associations with a closed-set Brotherhood combined to cause the ‘escape and run’ decision. An alternative view is that such formative experiences led Bicknell to adopt the approach he did - a mathematician by training, in addition to contemplative and reflective periods also required by ecclesiastical training became his defining skill-set for the path he, himself chose, they were complimentary to his final works, not adversaries to it. The exhibition of watercolours, design art, personal effects and 18-minute bio-film is at the Museo Biblioteca Clarence Bicknell, Bordighera, until 30th November 2017. (Mondays 8.30-13/13.30-17.00hr, Tuesdays and Thursdays 9-13hr). Curated by Susie Bicknell. Marcus Bicknell has recently been awarded with the Parmurelu D’Oru by the Descu Runde, for services to the region’s culture and the significance of Clarence’s life and work here. Written by Marcus Bicknell on 26 October 2017 . “By the Grace of God, John, just look at the Samuel Enderby will you? What a ship. Glorious. And full to the gunwhales with sperm oil, I’ll be bound. We’ll find out tomorrow our share”. Elhanan Bicknell and John Langton, his partner, were in their office in Newington Butts on the south bank of the Thames, looking out of the window across as street thronged with porters, traders, shipmen, an occasional hansome cab and all the hub-bub of Victorian industrial revolution London. The two middle-aged business-men were dressed in long coats with fur collars against the cold, despite being inside. It was the last days of 1845. Written by Marcus Bicknell on 13 October 2017 . At the meeting of the Bristol Naturalists Society at the Westbury on Trym Methodist Church, Westbury Hill, near Bristol BS9 3AA. A mile from Junction 17 of the M5. Graham Avery, Vice-President of the Clarence Bicknell Association (http://www.clarencebicknell.com/ ), will explain the links between this remarkable man and the Bristol botanists, and show the short film The Marvels of Clarence Bicknell. Among the botanists whom Clarence Bicknell welcomed at his summer home in the Maritime Alps in Italy were three members of Bristol Naturalists’ Society: Harold Stuart Thompson in 1907, and James Walter White & Cedric Bucknall in 1911. Clarence Bicknell was not only a botanist but a pioneer in the exploration of the prehistoric rock engravings of the Alps. He was also an artist, Esperantist, philanthropist, and founder of the Museo Bicknell in Bordighera. In Clarence's Time - what's to eat in the mountains? Written by Marcus Bicknell on 19 September 2017 . Helen Blanc-Francard writes...An extremely well researched, exhaustive and interesting paper entitled 'Les Plantes Alimentaires de la Vallee de La Roya’ (click here to download it) by Danielle Mousset was published in 1983. It gives us a real insight into exactly what Clarence, his household staff and any visiting guests would have eaten on a daily basis at Casa Fontanalba. Traditional recipes, perhaps some of the dishes prepared by the Pollinis, are listed and identified too are all the cultivated plants, herbs and fruits, the wild plants, berries and mushrooms that were growing in the countryside around the house. Many ingredients were gathered to be eaten fresh or to be dried, preserved or pickled and added to soups, salads or stews at different seasons of the year. There are chapters about the cultivation methods and seasons for the vegetables and fruit trees specific to the locality, the gardening tools and even the cooking utensils that were used. An excellent bibliography offers a rich source for further research. On the subject of food cultivation and preparation and to wind the clock back to the 12 year period Clarence was living in Casa Fontanalba (1906 - 1918) there are two collections in Tende of the locally made artefacts and objects dating from the beginning the century originating from the village houses, farms and rural properties around Val Casterino. They include the household and domestic utensils as well as the craft, agricultural and horticultural tools, implements and accoutrements of every sort that Clarence would have seen around him on a daily basis. Known as Les Musées d’Art Populaire http://www.tendemerveilles.com/component/content/category/31-musees.html the Collection Gabelli is a large collection that has been amassed by a collector over a period of 40 years. The address: 32 Rue Cotta, 06430 Tende. For opening times call (33) 0 4 93 04 69 05. The Collection Vada is a smaller collection of objects from rural life. The address: Place Lieutenant Kalck, 06430 Tende. For opening times call ( +33) 0 4 93 04 76 22 If visitors to Val Casterino actually want to sample some of the traditional alpine dishes that Clarence might have enjoyed there are several inns and restaurants close to Casa Fontanalba. These include: Le Chamois d’or, Les Mélèzes , Auberge Val Castérino , Auberge Marie-Madeleine . Details can be found on http://www.tendemerveilles.com/hebergements-restaurations/item/les-melezes.html . The Auberge Val Casterino claims that Clarence stayed there whilst waiting for his house to be built. It has been run by the same family for three generations and they are still using locally sourced ingredients and recipes that have been handed down through the family. https://www.valcasterino.fr/ To give you ’the taste’ of a couple of topics in this paper here are some pages about the customary gathering of mushrooms and wild plants for culinary use. In Clarence's Time - Mr. Bicknell or the Rev. Bicknell? Written by Marcus Bicknell on 17 September 2017 . "Clarence was active as a pastor, even after he gave up his work in the Church. "I use the expression 'gave up his work in the Church' because it's misleading to say that he 'left the Church'. He didn't send a letter to the Bishop resigning his post at Bordighera; he didn't need to since, like his predecessors, he was appointed for one season. "One should therefore consider Clarence after 1879 as a priest of the Church of England without ecclesiastical function - in fact, he was still entitled to be addressed as 'The Reverend' though evidently he didn't want that. " Written by Marcus Bicknell on 14 September 2017 . Francis Galton was according to Wiki an "English Victorian statistician, progressive, polymath, sociologist, psychologist, anthropologist, eugenicist, tropical explorer, geographer, inventor, meteorologist, proto-geneticist, and psychometrician. " Hm that long list is reminiscent of someone. He is also Charles Darwin's cousin, graduate of Trinity College Cambridge like Clarence, and his contemporary. He was staying at the Villa Rosa with Margaret and Edward Berry (he was Clarence's nephew) in February 1905 and signed their visitors' book (which is in our collection). According to letters hidden in the internet he had also been in Bordighera in 1902 staying in the Hotel de Londres. "This blessed Riviera air".I have seen no evidence that he knew or met Clarence, but in 1905 CB would have been thick as thieves with the Berrys and would have met many of their guests, especially a scientist of this repute? Written by Marcus Bicknell on 29 August 2017 . The Esperanto version of our 18-minute documentary film "The Marvels of Clarence Bicknell" is now on public release via the internet. To view, now, click on https://vimeo.com/clarencebicknell/esperanto . The Esperanto version will have its World Premier at the Italian Esperanto Association's Congress at Molicoro (Matera) Southern Italy this Friday, 1st September at 15h00. Nicola Minnaja will lecture on Clarence Bicknell at the same event. The sneak preview at the British Esperanto Congress in Edinburgh in May went well, as did the preview at the International Esperanto Congress in Seoul, South Korea, on 22nd July. The Esperanto version of the documentary film on Clarence Bicknell, directed by Rémy Masséglia and produced by Marcus Bicknell, was thanks to the energies and persistence of Esperanto supporters Michela Lipari (Director of the Italian Esperanto Association) and Humphrey Tonkin (President & University Professor of the Humanities, Emeritus, Hartford University, USA). <La Mirindaĵoj de Clarence Bicknell> has been voiced into Esperanto by Wera Blanke, Bill Chapman and Angela Tellier. We are proud to provide to the Esperanto community worldwide a precious memento of Clarence Bicknell's love for and support of the universal language. The response from the Esperanto community (there are about 100,000 of them worldwide) has been remarkable. The photo of Clarence shows him wearing his five-pointed Esperanto star. I recently read in one of his diaries that he wore the green four-pointed star when he first joined the Esperanto movement in 1897, and graduated to the five-pointed star when he could read, speak and write Esperanto. Is this still the process today? Written by Marcus Bicknell on 07 August 2017 . Valerie Lester, working away on the biography of Clarence Bicknell for 2018, takes a moment's relief to write to us "After my stay in Bordighera in February 2015 (that terribly cold winter), Dr. Daniela Gandolfi asked me to write a report on my experience at the IISL and Bicknell museum. I did it, and I thought that was that, but lo and behold, I’m now a bona fide contributor to " Ligures ", the official revue of the Istituto Internazionale di Studi Liguri!!!!" You can read Valerie's report by clicking on the pdf logo. Written by Marcus Bicknell on 06 August 2017 . Two new major donations received to the The Clarence Bicknell 2018 Centenary Fund ... what encouraging news. Now is the time for you to support us too, see below. The Istituto Internazionale di Studi Liguri (IISL) has been able to put €5,000 in to the fund, and the Clarence Bicknell Association (CBA) has been able to secure a donation from a USA-based trust for about €8,000 (exacty figure will be known when the transfer arrives). These two donations are in addition to the €12,736 secured form the USA by the CBA in April. With the €25,000 raised the IISL can proceed with Phase 1 of the works on the entrance to the garden where the giant Ficus tree has swallowed the gate, and new signage. Bordighera-based Architects Alessandro Liotta & Aldo Panetta are working closely with Dr Daniela Gandolfi and planning permission has bene secured. This will be a great way to celebrate the 2018 Centenary of Clarence's death. A few thousand euros are in the fund for the 2018 exhibitions round Europe; more details soon. We would be most grateful if, when you read this piece, you a) join the Clarence Bicknell Association www.clarencebicknell.com >Association >Membership b) make a donation yourself (button on the website home page) and c) make a couple of calls to contacts you might have who have the means to make a donation too. There is SWAG! That's the current US term for gifts you'll receive from us if you donate and these include signed copies of the new biography on Clarence and/or the quality print repro of the Casa Fontanalba Visitors' Book etc. The list of what you can get is on the last page of the information about the campaign: click on the pdf link. Written by Marcus Bicknell on 01 August 2017 . As part of the research for Valerie Lester on the upcoming biography of Clarence Bicknell, we have been able to see and record collections of letters and images relating to his life but kept in far-flung museums. We knew from Christopher Chippindale that Clarence Bicknell's letters to the Baroness Von Taube were in the British Museum (Natural History) in London, and was exciting to go to look through them and to photograph some of them. The letters themselves are being transcribed so that they can be read more easily and it may be that we can make them available on this web site in 2018. In the meantime I found some images which might be of interest to you. "Padre Giacomo, our unwearied Apostle of Charity, has been in some mesaure able to realise a project which he has had at heart for many years, namely, the foundation of a Home for the Aged Poor"
50,000 francs were still need to "furnish and endow the home". The third photo is the subscription bulletin to fill out if you wanted to give some money. There are several lines on the form which should have encouraged supporters to solicit donations from others. Next to them in the British Museum collection is this postcard of The Tearooms at Bordighera, probably around 1910. Was it here that Bicknell would distribute the appeal letters on behalf of his friend Viale? Does anyone have a copy of this card with more details, such as the exact date? Written by Marcus Bicknell on 16 July 2017 . Graham Avery’s study, published today on www.clarencebicknell.com, of the Bristol Botanists and their relationship with Clarence Bicknell is one of the most interesting discoveries to come out of the two books which list people who went to the Casa Fontanalba, discussed below. “The reason why I am writing to you is that the other day I found on the internet your transcription of the Casa Fontanalba visitors’ book, where on 19 July 1910 the name of Reginald Farrer appears together with that of Clarence Elliott. Your transcription adds notes on Elliott and Farrer and their roles in alpine gardening and plant hunting, but I wonder if you are aware that Farrer later mentioned this encounter with Bicknell in two of his publications? “In ‘Among The Hills’ (1911) Farrer described his visit to Val Casterino in 1910, and in ‘The English Rock Garden’ (1919) he referred to Clarence Bicknell as ‘a famous English botanist’, recommending readers to visit the house where he ‘spends long summers in the course of which he asks nothing better than to show the treasures of the hills to such fellow-collectors as desire to see them’. “I have been interested in Reginald Farrer for some time, particularly his books on his botanical excursions in the Maritime Alps (‘Among The Hills: A Book of Joy in High Places’) and the Dolomites (‘The Dolomites: King Laurin’s Garden‘). “If it is of interest to you, I could submit a short piece for publication in ‘On Beacon Hill’ about Bicknell and Farrer, quoting more fully the passages from the books mentioned above, together with a few comments on the two men and their encounter in 1910. So began a relationship which has proved most fruitful to me and to Graham, the most important of which is the research Graham has provided on Bicknell’s botany and his network of collectors, shown in the 20 papers he has written for us and which are published on our web site www.clarencebicknell.com. For example, Graham discovered that Bicknell sent 1,157 pressed flowers and 680 letters to Emile Burnat, botanist of Geneva; Graham’s original research and the paper he published with us is an example of the depth and significance of his recent findings about Bicknell. I was encouraged by this input from Graham and from others who knew about one or more person who signed the Visitors’ Book. So I proceeded to transcribe in 2013 those listed and illustrated in a second album, Clarence’s “Book of Guests in Esperanto” and two books published by Clarence “Flowering Plants and Ferns of the Riviera” and “A Guide to the Prehistoric Rock Engravings in the Italian Maritime Alps”. These lists are all available on the same Excel spreadsheet. Graham was intrigued by some further names written up by Clarence in the “Book of Guests in Esperanto”, and the placename “Bristol” alongside some of them. A link? Graham wrote to the appropriate organisations in Bristol and was pleased to get strong research support from Clive Lovatt, Archivist of the Bristol Naturalists’ Society, and Hannah Lowery, Archivist of Special Collections at the Arts and Social Sciences Library of the University of Bristol the Bristol Natural History Society. 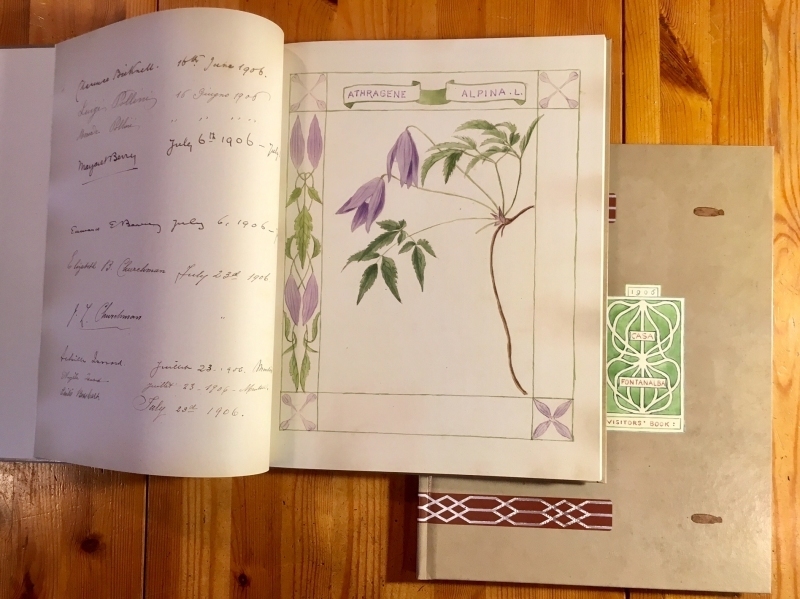 It turns out that the three Bristol men in Bicknell’s book were members of the Bristol Naturalists’ Society; it is possible that they had contacted Bicknell in 1903 before their trip to Majorca in search of the Pimpinella variety (image, right) which Bicknell had identified there and which was subsequently name Pimpinella bicknelli. They visited Bicknell in the Casa Fontanalba in 1907 and 1911. Written by Marcus Bicknell on 13 July 2017 . During a botanical excursion in 1897 on the Mediterranean island of Majorca Clarence Bicknell found an interesting plant. He realised that it was a member of the Umbellifer family – plants with long stems and flowers forming clusters (‘umbels’) – but he could not identify the species. After returning to his home in Bordighera he sent it and other specimens to the Conservatoire Botanique in Geneva, where the Curator, John Briquet, determined that it was a new species, which in honour of its finder he named Pimpinella Bicknellii. Written by Marcus Bicknell on 10 July 2017 . So pleased that our friend Dr Pietro Piana (who is Leverhulme Research Fellow, School of Geography at the University of Nottingham) has been able to make conclusions on the change in landscape in the Val Sasso near Bordighera from a 1906 water-colour by Clarence Bicknell which we provided to him. I find this fascinating Pietro, thanks. Written by Marcus Bicknell on 04 July 2017 . Working with Valerie Lester on research for her biography on Clarence Bicknell is very rewarding. Valerie asked me yesterday "Right now I’m knee deep in the Casa Fontanalba Visitors’ Book, and I find something out of whack in 1906. You have P.D. Peche (spelling?) and Desiree Mary Leake signing their names in it on 27th December. This is hard to believe. Do you think they visited Clarence in Bordighera and so loved the book that they felt compelled to sign it? I can’t imagine that Clarence took them up to Casterino (at 1565 metres above sea level, under snow from October to April - Ed.) in deep winter . . ."
So I got the vellum-bound album out and had a look. I realised quickly that "P.D.Peche" was my misreading back in 2011 when I transcribed the vistitors' book. You can download that transcript from our web site at the "Documents" page. It is of course "P.D.Leake" who we know from other entries in the Visitors' Book, and from the Book of Guests in Esperanto, is Percy D. Leake, husband of Desirée Mary Leake. I could not find any mention of the Leakes on the internet in half an hour, so if you know anything about them please write to us. "Percy D. Leake, rajtigita kalkulisto en London. Mi konatiĝis kun Gesinjoroj Leake sur la Pasejo de Monte Mora inter Saas kaj Macugnaga, kaj poste ni amikiĝis. Ili vizitis min in Bordighera Kristnaskan 1906 jaj pasigis tri tagojn en la neĝo." "Percy D. Leake, a chartered accountant in London. I met Mr. and Mrs. Leake on the Monte Mora Pass between Saas and Macugnaga, and then we became friends. They visited me in Bordighera at Christmas 1906 and spent three days in the snow." Our colleague researcher Graham Avery was right on the case too. With an hour he wrote back to Valerie and me "Look at the transcript of the Bicknell-Burnat correspondence for the period 1906-10 (available on www.clarencebicknell.com) that I sent to you and Valerie on 11 April 2017 and you will see that on 1 January 1907 Clarence wrote to Emile Burnat in Geneva:"
'J’ai passé, avec mes hôtes d’Angleterre, 2 nuits à Val Casterino. C’était un peu difficile d’y arriver à cause de la glace qui çà et là couvrait le sentier, et nous n’avions pas le pioche alpin pour couper les pas'. So there it is. Clarence and his mountaineering friends went to the Casa Fontanalba, brand new, in the depth of winter (pun intended). p. 44 Percy D. Leake Writer on Accountancy, London 1906 Anemone alpina L.
p. 46 Desiree Mary Leake Wife of P.D.Leake 1906 Primula marginata Cust. p. 6 Percy.D. Leake 26 8 1908 Signed P.D. Leake. I have left the accent off Desirée in places because it goes wrong in so many email programmes. Macugnaga is a mountain village at 1,327 metres elevation, in the province of Verbano-Cusio-Ossola, in the north of the Piedmont region of Italy. The Monte More Pass is east of Zermatt and south of Saas Fe, exactly on the Italian-Swiss border.